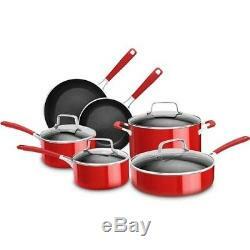 Aluminum Nonstick 10-Piece Empire Red Cookware Set with Lids. 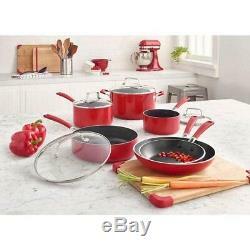 Experience the practicality and style that only nonstick aluminum cookware delivers with this KitchenAid 10-piece set. Heavy-gauge 4.0 mm aluminum ensures increased durability and even heating while an induction-capable stay-flat base resists warping. TeflonTM Xtra three-layer nonstick coating completes the impressive features for an easy, worry-free clean up. Saucepan with lid, 2.5 qt. Saucepan with lid, 3 qt. Saute pan with lid, and 6 qt. Heavy-gauge 4.0 mm aluminum ensures increased durability and even heating. 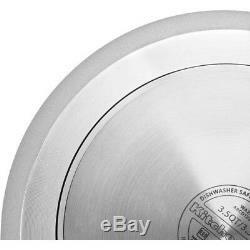 Solid stainless steel base provides induction capability and added durability to resist warping. TeflonTM Xtra three-layer, PFOA-free, nonstick coating covers entire interior surface including rivets for easy cleaning. Riveted stainless steel handle with silicone overmold. Domed tempered glass lids seal in moisture and lets you monitor your cooking at a glance. Oven safe up to 400°F. Lid, Saucepan, Saute Pan, Skillet. The item "Red 10-Piece Aluminum Cookware Set Nonstick Kitchen Saute Sauce Pans Oven Safe" is in sale since Sunday, September 9, 2018. This item is in the category "Home & Garden\Kitchen, Dining & Bar\Cookware". The seller is "lilypad_shop" and is located in Portland, Oregon. This item can be shipped to United States, Canada, United Kingdom, Denmark, Romania, Slovakia, Bulgaria, Czech republic, Finland, Hungary, Latvia, Lithuania, Malta, Estonia, Australia, Greece, Portugal, Cyprus, Slovenia, Japan, Sweden, South Korea, Indonesia, Taiwan, South africa, Thailand, Belgium, France, Hong Kong, Ireland, Netherlands, Poland, Spain, Italy, Germany, Austria, Bahamas, Israel, Mexico, New Zealand, Philippines, Singapore, Switzerland, Norway, Saudi arabia, Ukraine, United arab emirates, Qatar, Kuwait, Bahrain, Croatia, Malaysia, Brazil, Chile, Colombia, Costa rica, Panama, Trinidad and tobago, Guatemala, Honduras, Jamaica, Viet nam, Uruguay, China, Antigua and barbuda, Aruba, Belize, Dominica, Grenada, Saint kitts and nevis, Saint lucia, Turks and caicos islands, Barbados, Bangladesh, Bermuda, Brunei darussalam, Bolivia, Ecuador, Egypt, Gibraltar, Guadeloupe, Iceland, Jordan, Cambodia, Cayman islands, Sri lanka, Luxembourg, Monaco, Martinique, Maldives, Nicaragua, Oman, Pakistan, Paraguay.